Exhaustion of stem cells is a hallmark of aging. In the Drosophila testis, dedifferentiated germline stem cells (GSCs) derived from spermatogonia increase during lifespan, leading to the model that dedifferentiation counteracts the decline of GSCs in aged males. To test this, we blocked dedifferentiation by mis-expressing the differentiation factor bag of marbles (bam) in spermatogonia while lineage-labeling these cells. Strikingly, blocking bam-lineage dedifferentiation under normal conditions in virgin males has no impact on the GSC pool. However, in mated males or challenging conditions, inhibiting bam-lineage dedifferentiation markedly reduces the number of GSCs and their ability to proliferate and differentiate. We find that bam-lineage derived GSCs have significantly higher proliferation rates than sibling GSCs in the same testis. We determined that Jun N-terminal kinase (JNK) activity is autonomously required for bam-lineage dedifferentiation. Overall, we show that dedifferentiation provides a mechanism to maintain the germline and ensure fertility under chronically stressful conditions. From the heart to the brain, our bodies are made of a collection of cells that are specialized to perform precise roles. Yet, certain organs host ‘stem cells’, which can become any kind of tissue. For example, the testicles of the fruit fly contain germline stem cells; when one of these cells divides, a daughter remains unspecialized, while the other specializes – or differentiates – to become sperm. Despite previous beliefs, a cell that is undergoing specialization can dedifferentiate to become a stem cell again. As the organism gets older, stem cells become ‘exhausted’: they divide less, and lose their ability to remain unspecialized. Scientists therefore proposed that dedifferentiation could be a way to replenish a dwindling pool of stem cells, and ward off the effects of age. However, this line of thought has not been tested in the laboratory. Here, Herrera and Bach tried to test this assumption by creating two populations of male fruit flies. One was genetically intact and the other was modified so that the cells that would become sperm cells could not dedifferentiate to become germline stem cells again. The insects were then raised in either a standard environment (plenty of food and no females) or in stressful conditions (periods of starvation with or without mating). The experiments showed that dedifferentiation was important to maintain a robust germline stem cell pool, both in the short and long term. This, however, was only the case in the difficult environment; the ability to dedifferentiate made no difference in the easier living conditions. In addition, Herrera and Bach observed that, in the flies’ testicles, stem cells obtained through dedifferentiation divided much more often than the ‘original’ stem cells. Finally, further analyses highlighted a series of genes that are required for dedifferentiation. That stem cells coming from dedifferentiated cells divide at a higher rate could be relevant to scientists across various fields. For example, this knowledge may help those who study how tissues regenerate after injury, a process that involves dedifferentiation. It also may be used as a cautionary tale for researchers who work on induced pluripotent stem cells – which are created in the laboratory by dedifferentiating specialized cells. This may be especially important because these cells could one day be put in patients to treat diseases such as Parkinson’s or Alzheimer’s. A robust stem cell pool is critical to the maintenance of highly proliferative tissues during an organism’s lifetime. Adult tissue stem cells typically reside in niches, anatomically defined as microenvironments that support their ‘stemness’ and promote their proliferation, resulting in some daughter cells that retain stem cell characteristics and some that begin differentiation (Morrison and Spradling, 2008; Blanpain et al., 2014; Spradling et al., 2011). Depletion or reduction of stem cells results in tissue atrophy, and the exhaustion of stem cell function is a hallmark of aging (López-Otín et al., 2013; Wang and Jones, 2011). Thus, the mechanisms that maintain stem cells during an individual’s lifespan are of critical importance to understanding the relationship between stem cells and aging and to develop therapies against aging-related clinical conditions like infertility and Parkinson’s. The stem cell pool is dynamic and responds to insults, including injury and starvation in both invertebrate and mammalian model organisms (Angelo and Van Gilst, 2009; Tetteh et al., 2016; van Es et al., 2012; Yang and Yamashita, 2015; McLeod et al., 2010; Li and Jasper, 2016). Recently, dedifferentiation has emerged as a conserved mechanism underlying the replenishment of the stem cell pool after stem cell depletion (Merrell and Stanger, 2016). In the mouse intestine, extensive radiation ablates Lgr5-positive crypt stem cells and lineage-tracing experiments revealed that secretory cells dedifferentiate into Lgr5-positive stem cells following this insult (van Es et al., 2012). In the Drosophila intestine, complete starvation induces the loss of all intestinal stem cells, and polyploid enterocyte cells undergo a reduction in ploidity (called amitosis) and transform into intestinal stem cells (Lucchetta and Ohlstein, 2017). In Drosophila gonads, after forced differentiation of all germline stem cells (GSCs), differentiating spermatogonia revert to the stem cell state and become functional GSCs (Brawley and Matunis, 2004; Kai and Spradling, 2004; Sheng et al., 2009). While these previous studies showed that dedifferentiation indeed occurs after acute insults or injuries, they did not address its functional significance in these events. Here, we test the functional importance of dedifferentiation through a new genetic approach. We have developed a genetic technique to indelibly mark the cells undergoing dedifferentiation, while at the same time functionally inhibiting the process. We used the Drosophila testis for these studies because of the powerful genetic techniques available in this organism and the broad knowledge about the biology of this organ and its various cell types. In this tissue, approximately 8–14 GSCs reside in a quiescent niche (Greenspan et al., 2015). GSCs adhere to niche cells and undergo oriented mitosis, resulting in one daughter cell that retains the stem cell state and remains in contact with the niche (Figure 1A). The other GSC daughter cell (the gonialblast) is physically displaced from the niche. After encapsulation by somatic support cells, this latter daughter cell begins differentiation through four rounds of mitotic divisions with incomplete cytokinesis, resulting in 2-, 4-, 8- and 16-cell spermatogonial cysts, the lattermost of which undergoes meiosis to produce 64 spermatids. At the 4- and 8-cell cyst stage, germ cells express bag of marbles (bam), which is necessary and sufficient for their differentiation (Sheng et al., 2009; Gönczy et al., 1997). The testis niche also supports a somatic stem cell population called cyst stem cells (CySCs) that produces somatic support cells, which exit the cell cycle and ensheath differentiating GSC daughter cells. Blocking bam-lineage dedifferentiation does not protect the GSC pool under normal laboratory conditions. (A) Schematic of the Drosophila testis. Germline stem cells (GSCs) undergo differentiation through several rounds of mitotic divisions with incomplete cytokinesis (the cells remain connected through a structure, the fusome). During the transition from 4- to 8-cell stage, cells acquire the expression of the differentiation factor bam. Germline cells at these stages can undergo dedifferentiation returning to a stem cell state. (B–E) Representative images of the testis stem cell niche in control bam-Gal4, UAS-LacZ (bam > LacZ, B, C) or bam-Gal4, UAS-bam (bam > bam, D, E), where we blocked bam-lineage dedifferentiation at 0 days and 45 days under normal aging conditions. The bam lineage is labeled in green, the germline (Vasa) is red and the niche (FasIII) is blue. Each GSC is outlined by a dashed line. There are no GSCs derived from the bam lineage in the control or bam > bam testis at 0 days (B, D). At day 45, the control contains bam-lineage positive GSCs (indicating that they arose through dedifferentiation) (C, arrows). However, at the same age, there are no bam-lineage positive GSCs in the bam > bam testis, demonstrating the efficacy of our technique (E). (F) Percentage of bam-lineage dedifferentiated GSCs in bam > LacZ (gray bars) and bam > bam (red bars) testes at 0 and 45 days. The proportion of bam-lineage GSCs significantly increases in the control bam > LacZ at 45 days, while this value remains unchanged in bam > bam flies. (G) Relative number of GSCs at 0 and 45 days (see Materials and methods for details). In control bam > LacZ testes (gray bars), the relative number of GSCs declines from 0 to 45 days. If bam-lineage dedifferentiation contributes to the maintenance of a robust GSC pool during aging, we predict that blocking dedifferentiation would enhance the decline in total GSC number. However, there is no statistical difference between the control and bam > bam genotypes at 45 days. Scale bars represent 10 µm. Bars on charts represent mean ± SE. *p<0.05, ***p<0.001. During aging, the population of GSCs declines such that at 50 days of adulthood ~35% of GSCs are lost from the niche and the remaining GSCs have reduced proliferation (Boyle et al., 2007; Wallenfang et al., 2006). The 35% reduction in the GSC pool in aged males is much smaller than predicted. The average half-life of a GSC is 14 days, and for a testis with 10 GSCs at day 0 of adulthood, there should be <1 GSC at 50 days (Boyle et al., 2007; Wallenfang et al., 2006). In other words, the reduction in the total GSC pool should be more than 90% at 50 days. This discrepancy in predicted vs observed size of the GSC pool raised the possibility that a mechanism such as spermatogonial dedifferentiation could be responsible for the apparent resistance of the GSC pool to the deleterious effects of aging (Wang and Jones, 2011; Wallenfang et al., 2006; Cheng et al., 2008). However, to date no study has tested this hypothesis by specifically inhibiting dedifferentiation in spermatogonia. Certain genetic manipulations (transient removal of responses to niche signals or transient mis-expression of the key differentiation factor bam) cause all GSCs to differentiate. However, upon silencing of these triggers, spermatogonia break apart, migrate back to the niche, outcompete the resident CySCs and become functional GSCs by transducing JAK/STAT signals and repressing bam expression (Brawley and Matunis, 2004; Sheng et al., 2009; Sheng and Matunis, 2011). Interestingly, these studies revealed that the 8-cell spermatogonial cyst is the oldest stage still competent to dedifferentiate. bam-lineage labeling analysis of 4- and 8-cell spermatogonial cysts revealed that the proportion of dedifferentiated cells in the GSC pool increases with aging; in 50 day old males, ~40% of the GSCs are derived from bam-lineage spermatogonia that dedifferentiated (Cheng et al., 2008). Here, we have developed a methodology that enabled us to inhibit specifically dedifferentiation of bam-expressing, 4- and 8-cell spermatogonial cysts without apparent side effects, while at the same time lineage-tracing these cells. This has allowed us to address the long-term effects of dedifferentiation. Surprisingly and contrary to predictions, we find that bam-lineage dedifferentiation is not required to maintain the GSC pool during aging under normal laboratory conditions. However, it is critical to maintain a robust GSC pool under chronically stressful conditions. Our methodology also allows the identification of dedifferentiated GSCs from their non-dedifferentiated siblings, facilitating the comparison of their characteristics. We find that bam-lineage dedifferentiated GSCs have a higher proliferative rate compared to their sibling GSCs in the same testis. Finally, we show that Jun N-terminal kinase (JNK) signaling is activated in germ cells during recovery from stress. By inhibiting JNK activity in bam-expressing spermatogonia, we demonstrate that this pathway is essential for dedifferentiation of these cells. In order to study the contribution of dedifferentiation to the maintenance of the GSC pool, we lineage-traced spermatogonial cells. Similar to a previous study (Cheng et al., 2008), we used a bam-Gal4 line, expressed specifically in 4- and 8-cell spermatogonial cysts, to drive UAS-Flippase (Flp) expression, and this Flp in turn excises an FRT-stop-FRT from the ubiP63E-FRT-stop-FRT-GFP cassette (Evans et al., 2009). After recombination, GFP becomes an indelible marker of differentiating germ cells that had expressed bam-Gal4, and GFP persists even if the cell turns off the bam promoter. Since transient germline mis-expression of bam is sufficient to induce germline differentiation (Sheng et al., 2009; Ohlstein and McKearin, 1997), we speculated that mis-expression of additional Bam protein in these bam-Gal4-positive spermatogonia (referred to as bam > bam) should prevent them from undergoing dedifferentiation (Figure 1—figure supplement 1). As a control and to maintain similar titration of the Gal4 protein, we mis-expressed a neutral construct UAS-LacZ by bam-Gal4 in a second set of flies (referred to as bam > LacZ). For reasons unknown to us but also observed by another group (Cheng et al., 2008), some somatic support cells are labeled for real-time and lineage bam expression (Figure 1B and Figure 1—figure supplement 2C). We note that this methodology will likely not label all dedifferentiating germ cells, as it has been speculated that gonialblasts and 2-cell spermatogonia can revert to become GSCs. We also note that the efficiency of Flp is not 100%, and so we are not labeling all bam-lineage cells. In this study, we refer to GFP-positive germ cells as ‘bam-lineage positive’ and ‘dedifferentiated’, and GFP-negative germ cells as ‘bam-lineage negative’ and ‘wild type siblings’. We first analyzed the role of dedifferentiation in control bam > LacZ and experimental bam > bam males during standard aging conditions, that is, maintaining flies at a low density, in the absence of females and on standard food. In control flies, we observed a significant increase in the percentage of GFP-positive GSCs derived from dedifferentiated bam-lineage spermatogonia, from 7.0% in young flies to 21.6% in 45-day-old males (Figure 1B,C,F), consistent with a prior study (Cheng et al., 2008). As expected, GFP-positive germ cells lose bam expression in the process of reverting to a GSC identity (Figure 1—figure supplement 2A–B’’). However, bam mis-expression in the bam lineage effectively blocked lineage dedifferentiation, as there was no significant increase in the percentage of lineage-dedifferentiated GSCs in aged males, from 3.3% in young flies to 3.6% in 45-day-old flies (Figure 1D,E,F). These results demonstrate that bam mis-expression is an effective way to prevent dedifferentiation. Prior work has shown that the number of GSCs decreases slightly during aging under normal laboratory conditions, and this has led to the model that dedifferentiation provides a means to offset normal GSC loss during lifespan (Wang and Jones, 2011; Wallenfang et al., 2006; Cheng et al., 2008). If this hypothesis is correct, we would expect a further reduction in GSC number after bam mis-expression by bam-Gal4. Because the starting number of GSCs varies from strain to strain, we compared the relative number of GSCs between bam > LacZ and bam > bam flies. To our surprise, we found that the relative number of GSCs decreases significantly by 10% after 45 days in both genotypes (from 10.4 to 9.4 cells in bam > LacZ, and from 7.9 to 7.1 cells in bam > bam) (Figure 1G and Supplementary file 1). Furthermore, we did not observe any notable differences between aged bam > LacZ and aged bam > bam testes, as all stages of spermatogenesis appeared similar between the two genotypes (see Figure 4A–B and G–H). We note, however, that due to the fact that some of the bam-expressing cells might not undergo recombination (due to incomplete Flp efficiency), we cannot rule out the possibility that unlabeled cells may dedifferentiate and help to maintain the GSC pool under normal laboratory conditions. Additionally, prior work has shown that symmetric renewal, whereby a gonialblast swivels to gain direct access to the niche, occurs at low levels in testes from wild type males (Sheng and Matunis, 2011). It is possible that by blocking bam-lineage dedifferentiation, we are shifting the equilibrium towards symmetric renewal, but live imaging will be needed to test this hypothesis. Nevertheless, although unexpected and contrary to our predictions, our results strongly suggest that dedifferentiation of the bam-lineage does not play an important role in maintaining the GSC pool during aging under normal laboratory conditions. We speculated that dedifferentiation could be vital during challenging life conditions, such as starvation. Previous work has shown that 6–15 days of protein deprivation (also generally referred to in the literature as ‘starvation’) causes a 25% reduction in total GSC number (Yang and Yamashita, 2015; McLeod et al., 2010). Furthermore, the number of GSCs recovered to original levels after 5 days of refeeding on standard food (McLeod et al., 2010). We hypothesized that the recovery of GSCs during refeeding could result from dedifferentiating spermatogonia. To test this model, we subjected bam > LacZ flies to 15 days of protein starvation, followed by a 9-day time course of refeeding (Figure 2A). We assessed the proportion of dedifferentiated GSCs at the end of the starvation period and at different time points during the refeeding phase. Similar to these prior reports, we observed a 33% decrease in the relative number of GSCs after starvation (10.4 at 0 days and 7.0 after 15 days of starvation) and a full recovery of the GSC pool after 5 days of refeeding (Figure 2B,B’ and Supplementary file 1). In accordance with previous studies, we found that after the 15-day protein starvation period, the percentage of dedifferentiated GSCs did not increase compared to day 0 (compare Figure 2A–G and [Yang and Yamashita, 2015; McLeod et al., 2010]). However, after the 5 day refeeding period, this proportion significantly increased from 4.2% at day 0 after refeeding to 19.7% at day five after refeeding and did not increase further after longer refeeding times (Figure 2A and Supplementary file 1). We note that this increase in dedifferentiation during the refeeding period strongly correlates with the recovery in the size of the GSC pool (Figure 2B’, gray dashed line). bam-lineage dedifferentiation accelerates the recovery of the GSC pool after starvation. (A) 9-day time course of the proportion of bam-lineage dedifferentiated GSCs during refeeding following 15 days of starvation in control bam > LacZ testes. (B) The total number of GSCs in bam > LacZ testes at 0 days prior to starvation and refeeding. (B’) Using the same data set as in (A), we counted the average total number of GSCs in all testes at each time point (dashed line). We then analyzed this data set according to whether bam-lineage dedifferentiated GSCs were present (light blue line) or absent (dark blue line). We observed two key features. First, there were significantly more total GSCs at nearly every time point in testes that contained bam-lineage dedifferentiated GSCs (light blue line). Second, the original 0 day total GSC number was recovered much faster in testes with bam-lineage GSCs, at 3 days of refeeding. By contrast, testes lacking bam-lineage GSCs required 7 days to fully recover the GSC pool (dark blue line). (C–F) Examples of testes from control bam > LacZ (C,D) and bam > bam (E,F) flies at 0 days and after 15 days of starvation and 5 days of refeeding. The bam lineage is labeled in green, the germline (Vasa) is red and the niche (FasIII) is blue. GSCs are outlined by the dashed line. There are no GSCs derived from bam-lineage germ cells in the control or bam > bam testis at 0 days (C,E). After 15 days starvation and 5 days refeeding, the control contains GSCs positive for the bam-lineage (D, arrows). However, at the same time point, there are no bam-lineage positive GSCs in the bam > bam testis (F). (G) Proportion of bam-lineage cells in the GSC pool in the aforementioned genotypes and time points. After starvation and refeeding, there is a significant reduction in the proportion of bam-lineage GSCs in bam > bam testes (red bar) compared to the control (gray bar). (H) Relative number of GSCs after 0, 3 or 5 days of refeeding following starvation. Light blue line indicates control bam > LacZ testes containing bam-lineage GSCs, whereas the dark blue line represents control testes lacking bam-lineage dedifferentiation. The red line represents bam > bam testes where dedifferentiation was blocked. Note that blocking dedifferentiation (red line) significantly delays the recovery of the GSC pool compared to testes with bam-lineage dedifferentiation (light blue line), in a manner similar to what happens in the control testes lacking dedifferentiated GSCs (dark blue line). Scale bars represent 10 µm. Bars on charts represent mean ±SE. *p<0.05, **p<0.01, ****p<0.0001. Among the bam > LacZ controls, we observed variable numbers of bam-lineage dedifferentiated GSCs per testis. Most testes contained both GFP-negative wild type and GFP-positive dedifferentiated GSCs at the niche, however, some testes did not contain any dedifferentiated GSCs and some testes contained all dedifferentiated GSCs. We hypothesized that testes with more dedifferentiated GSCs had a faster recovery of the GSC pool after starvation and refeeding. Comparing testes with at least one dedifferentiated GSC (Figure 2B’, light blue line) to those with 0 dedifferentiated GSCs (Figure 2B’, dark blue line), we found that the former fully recovered the pool of GSCs after 3 days, while the latter required significantly longer, up to 7 days. Although we cannot exclude other variables such as germ cell death, GSC loss, and GSC gain through symmetric renewal, this correlation strongly suggests that bam-lineage dedifferentiation accelerates the recovery of the GSC pool under challenging conditions. Thus, we hypothesized that preventing dedifferentiation using bam > bam flies would mimic this delay in recovery of the GSC pool observed in control flies lacking dedifferentiation. In bam > bam testes, the proportion of dedifferentiated GSCs did not increase (0% at day 0 after refeeding and 1.8% at day 5 after refeeding), in contrast to the bam > LacZ controls (Figure 2C–G and Supplementary file 1). Indeed, we observed that blocking dedifferentiation (i.e., bam > bam) retards the recovery of the GSC pool in a similar manner to control bam > LacZ testes devoid of bam-lineage dedifferentiation (Figure 2H, compare red to dark blue line). Compared to bam > LacZ testes with dedifferentiated GSCs, both bam > bam testes and bam > LacZ testes lacking dedifferentiated GSCs were significantly delayed in the recovery of the GSC pool (Figure 2H, compare red and dark blue lines to the light blue line). Centrosome mis-orientation in GSCs increases during aging and after irradiation (Cheng et al., 2008). We found that both dedifferentiated GSCs and their ‘wild type’ siblings displayed equally high rates (~35–40%) of centrosome mis-orientation after starvation and refeeding (Figure 2—figure supplement 1, third set of bars), similar to maximal rate of 40% reported in a previous study (Cheng et al., 2008). These results suggest that centrosome mis-orientation was not specific to bam-lineage dedifferentiated GSCs. Taken together, these results suggest that dedifferentiation of the bam-lineage promotes recovery of the GSC pool after challenging conditions. Our results suggest a functional role of dedifferentiation in maintaining a robust GSC pool during transient insults or challenging conditions. We further speculated that dedifferentiation could have additional biological roles when such conditions become chronic. We wondered whether males always housed with (and presumably mating with) females could force GSCs in the testis to cope with a higher demand for sperm production and thus accelerate the age-related reduction of the GSC pool. We note that while mating is a normal physiological event, it is stressful as mating significantly decreases both male and female lifespans (Branco et al., 2017; Fowler and Partridge, 1989). However, little is known about the effects of mating on the GSC pool in males. To determine this, we monitored the mitotic index in unmated vs continuously mated bam > LacZ males after 15 days of adulthood. We found significantly more GSCs in M-phase in testes from mated males compared to age-matched unmated males (Figure 3—figure supplement 1A and Supplementary file 2). We next assessed if both GFP-negative wild type and GFP-positive dedifferentiated GSCs in these two conditions had similar M-phase distribution. Indeed, in mated males there were more wild type and dedifferentiated GSCs in M-phase compared to unmated males (Figure 3—figure supplement 1B and Supplementary file 2). These data suggest that there is a systemic or non-autonomous effect of mating on GSC proliferation. In a second set of experiments, we addressed whether mating increased dedifferentiation of the bam lineage. We aged bam > LacZ and bam > bam flies for 45 days in the constant presence of wild type OregonR females. The rate of dedifferentiation in control bam > LacZ testes significantly increased from 7.0% at 0 days to 30.8% at 45 days when males are housed with females (Figure 3—figure supplement 1C and Supplementary file 1). As expected, the rate of dedifferentiation upon mating does not increase in bam > bam flies (Figure 3—figure supplement 1C and Supplementary file 1). Moreover, while the relative number of GSCs is not diminish in testes from mated bam > lacZ controls, suggesting the pool is preserved, it is significantly (18%) smaller in mated bam > bam flies (Figure 3—figure supplement 1D and Supplementary file 1). Therefore, bam-lineage dedifferentiation is important in maintaining the size of the GSC pool under mating conditions. This result is in contrast to that obtained in unmated conditions (see Figure 1G). Since both GSC proliferation and bam-lineage dedifferentiation are significantly increased upon mating, we speculated that this would affect GSC dynamics in the niche by increasing GSC turnover. Specifically we hypothesized that neutral GSC clones should be lost more frequently in testes from mated males compared to unmated ones. To test this, we generated neutral MARCM clones that expressed GFP but were otherwise wild type and measured clone residency in the niche at 2 days post clone induction (dpci) to establish clone induction frequency and at 15 dpci to monitor clone retention. As expected, clones were generated at equal frequency in both unmated and mated conditions (Figure 3—figure supplement 1E, first set of bars). However, at 15 dpci, there was a significant difference in clone retention with fewer clones retained in mated testes (Figure 3—figure supplement 1E, second set of bars). These results are consistent with the model in which increased proliferation of GSCs and outcompetition of resident GSCs by dedifferentiating germline cells alter stem cell dynamics in the testis niche. After establishing the stressful effects of starvation and mating, we designed an aging protocol that might resemble sub-optimal conditions faced by flies in the wild, including intermittent access to food and to mating partners. This protocol consists of cycles of 6 days of protein starvation, which is sufficient to induce a significant reduction in the GSC pool (Yang and Yamashita, 2015), followed of 4 days of refeeding. In each cycle, during the last 2 days of the 4 days of refeeding, we added virgin females to the vials, which were subsequently removed for the next cycle. Our 10-day cycle of starvation and refeeding allowed us to accommodate 4 cycles of challenging conditions (see Materials and methods). 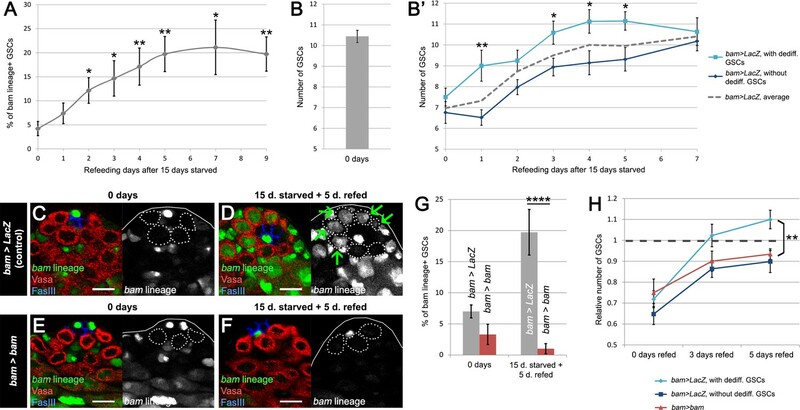 In control testes, after 4 cycles of starvation, refeeding and mating, we observed a significant increase in the rate of bam-lineage dedifferentiation, from 6.9% at day 0% to 43.9% at day 41 (Figure 3A,B,E and Supplementary file 1). As expected in bam > bam testes, the rate of dedifferentiation was completely blocked, 3.3% at day 0% to 2.1% at day 41 (Figure 3C,D,E and Supplementary file 1). Importantly, when we blocked dedifferentiation, the relative number of GSCs was significantly reduced by 33% compared to the controls after four cycles (Figure 3F and Supplementary file 1). These results indicate that, under these chronic challenging conditions, bam-lineage dedifferentiation is important to preserve the GSC pool. bam-lineage dedifferentiation is required for maintaining a robust GSC pool under chronic challenging conditions. (A–D) Representative images of the testis stem cell niche in control bam > LacZ (A,B) and bam > bam (C,D) testes at 0 days (A,C) and after 4 cycles of starvation, refeeding and mating (B,D). The bam lineage is labeled in green, the germline (Vasa) is red and the niche (FasIII) is blue. GSCs are outlined by the dashed line. After four cycles, bam > LacZ testes contain several bam-lineage GSCs (B, arrows). In the same conditions, bam > bam testes have fewer GSCs and none of them are dedifferentiated (D). (E) Proportion of bam-lineage GSCs in the indicated genotypes and conditions. The proportion of bam-lineage GSCs soars to nearly 50% in control testes (gray bars), and this process is completely abrogated in bam > bam testes (red bars). (F) The relative number of GSCs in control bam > LacZ and bam > bam testes. After 4 cycles of challenging conditions, there is a significant decline (33%) in the GSC pool in testes where dedifferentiation is prevented. Scale bars represent 10 µm. Bars represent mean ± SE. ****p<0.0001. We speculated that the reduced number of GSCs in testes lacking bam-Gal4 lineage dedifferentiation might impact spermatogenesis. Indeed, after 2 and 4 cycles of starvation and refeeding, bam > bam testes were thinner and appeared to lack cells in intermediate stages of spermatogenesis (Figure 4B,D,F) when compared to matched bam > lacZ controls (Figure 4A,C,E). This phenotype is specific to chronic challenging conditions, because testes from 45 day old, fed and unmated flies displayed no apparent differences between the two genotypes (Figure 4G,H). We quantified the number of early-stage spermatogonia in the two genotypes: goniablasts (or 1-cell), 2-cell, 4-cell and 8-cell cysts. At 0 days, the number of gonia at each stage is indistinguishable between bam > LacZ and bam > bam flies (Figure 4I and Supplementary file 3), while as noted above, the absolute number of GSCs was distinct between the two genotypes. However, after 4 cycles of starvation, refeeding and mating, the number of gonia was significantly reduced up to 33% at each gonial stage when dedifferentiation was blocked (Figure 4J and Supplementary file 3). The reduced number of gonia in bam > bam testes is unlikely to be a direct result of the bam mis-expression, as the bam-Gal4 line used is only active in the 4- and 8-cell stage, and bam-Gal4 activity disappears once the cells have dedifferentiated (Figure 1—figure supplement 2). Instead, we observed a decrease in all the stages of spermatogenesis, including the pre-meiotic cysts, with a low-magnification inspection (Figure 4A–F). Spermatogenesis is compromised under chronic challenging conditions when bam-lineage dedifferentiation is inhibited. (A–H) Representative images of control bam > LacZ (A,C,E,G) and bam > bam (B,D,F,H) testes at 0 days (A,B), after 2 (C,D) or 4 (E,F) cycles of challenging conditions or in 45-day-old fed unmated males (G,H). The bam lineage is labeled in green and the germline (Vasa) is red. Note when preventing dedifferentiation and subjecting the animals to challenging conditions, the testes appear involuted, and visual inspection revealed fewer transit-amplifying spermatogonia and fewer pre-meiotic spermatocytes (D,F). These phenotypes were not observed in 45-day-old fed unmated bam > bam testes (H), indicating that they do not arise simply as a result of aging. (I–J) Quantification of the number of GSCs and 1-, 2-, 4- and 8-cell spermatogonial cysts at 0 days (I) and after 4 cycles of challenging conditions (J) in bam > LacZ (gray line) and bam > bam (red line) males. Spermatogonial staging was determined using an antibody to αSpectrin, which marks the fusome/spectrosome. After four cycles, there were significantly fewer spermatogonia of each class in testes where dedifferentiation was inhibited (bam > bam). Scale bars represent 200 µm. Data points represent mean ±SE. **p<0.01, ***p<0.001, ****p<0.0001. The reduced number of gonia in bam > bam testes after four cycles (Figure 4J) could result from the reduced GSC pool in these testes (Figure 3F). However, an alternative explanation is that bam > bam testes lack the dedifferentiated GSCs found in control bam > lacZ testes and that these dedifferentiated GSCs have a higher proliferation rate than ‘wild type’ siblings and produced more gonial offspring. To assess whether bam-lineage dedifferentiated GSCs are more proliferative than their lineage-negative, wild type siblings, we directly compared the number of offspring of GFP-positive GSCs to those from GFP-negative GSCs in the same bam > lacZ control testis. We divided the number of spermatogonia at each stage by the number of labeled GSCs that were producing them. This experiment is analogous to a clonal analysis, but here we scored the contribution of an entire type of GSC rather than of a single GSC. Strikingly, we observed that after 4 cycles of starvation, dedifferentiated GSCs contribute up to 45% more offspring than their wild type siblings in the same testis (Figure 5A and Supplementary file 3). Additionally, we directly measured proliferation by scoring the proportion of GSCs positive for the S-phase marker EdU and the M-phase marker phospho-Histone3 (pH3). We found that there were significantly more bam-lineage positive GSCs in S-phase and in M-phase compared to bam-lineage negative GSCs (Figure 5B,C). Centrosome mis-orientation in GSCs slows the rate of proliferation during aging (Cheng et al., 2008). However, both bam-lineage-positive and lineage-negative GSCs had equally high rates of centrosome mis-orientation after 4 cycles of starvation and refeeding (Figure 2—figure supplement 1, fourth set of bars). These data suggest that in some challenging conditions, factors independent of centrosome orientation may regulate GSC proliferation rates. bam-lineage GSCs are more proliferative than their lineage-negative siblings. (A) Relative contribution to 1-, 2- or 4-cell spermatogonial cysts of bam-lineage GSCs (green line) and lineage-negative sibling GSCs (black line) in the same bam > LacZ testis (see Materials and methods for details). bam-lineage GSCs have significantly more spermatogonial offspring than lineage-negative sibling GSCs. (B) EdU incorporation in bam-lineage GSCs (green bar) and lineage-negative sibling GSCs (gray bar) in the same bam > LacZ testis. There are significantly more EdU-positive lineage-positive GSCs than EdU-positive lineage-negative sibling GSCs. (C) pH3 labeling in bam-lineage GSCs (green bar) and lineage-negative sibling GSCs (gray bar) in the same bam > LacZ testis. There are significantly more pH3-positive bam-lineage GSCs than pH3-positive lineage-negative sibling GSCs. The raw data are presented in the chart below the graph. Data points represent mean ±SE. *p<0.05, **p<0.01. We reasoned that JNK signaling could be promoting spermatogonial dedifferentiation because of its established roles in cellular reprogramming and stress responses. An evolutionarily conserved kinase cascade, the JNK pathway plays essential roles in regeneration of numerous organs, including imaginal discs and intestine, and can trigger changes in cell identity and transdifferentiation (Jiang et al., 2009; Bergantiños et al., 2010; Herrera et al., 2013; Smith-Bolton et al., 2009; Sun and Irvine, 2014; Herrera and Morata, 2014; Lee et al., 2005; Gettings et al., 2010). JNK signaling is activated in a variety of stress responses; it is detected in the somatic support cells in the testis during protein starvation and contributes non-autonomously to the maintenance of the GSC pool (Yang and Yamashita, 2015). We were unable to detect real-time JNK activity reporters puckered (puc)-LacZ (Martín-Blanco et al., 1998) or TRE-GFP (Chatterjee and Bohmann, 2012) in the germline during or after starvation (data not shown). Since the frequency of dedifferentiation is on average 2.2 GSCs per testis during 5 days of refeeding (Supplementary file 1), the chances for detecting this JNK activation are low, especially if it is transient and/or if only low levels are required. For this reason, we decided to use a more sensitive assay: lineage labeling of puc-Gal4-positive cells. puc is a transcriptional target and repressor of the pathway (Martín-Blanco et al., 1998). Similar to the bam-Gal4 lineage labeling, Flp under the control of puc-Gal4 recombines an ubiP63E-FRT-stop-FRT-GFP cassette so that cells that have expressed puc in the past, even at low levels, will become permanently labeled by GFP (genotype: puc > GFP). Two puc-Gal4 lines with independent origins were used for these experiments (see Materials and methods), showing similar results. At 0 days old, testes from puc > GFP males had GFP expression in a fraction of hub cells. However, GFP expression was largely absent from somatic cyst cells and the germline, with 20% and 12% of testes, respectively, labeled at 0 days in fed conditions (Figure 6A,F,F’). Testes from puc > GFP males that were maintained under fed conditions and aged for 15 or 20 days showed a similar trend of low rates of labeling (Figure 6B,C,F,F’). After 15 days of protein starvation, 51% of puc > GFP testes displayed GFP labeling of somatic cyst cells, while GFP expression in the germline was observed in less than 11% of the cases (Figure 6D,F,F’). This increase of JNK signaling in the somatic cells after starvation is consistent with a previous study (Yang and Yamashita, 2015). After 15 days of starvation and 5 of refeeding, 82% of puc > GFP testes had GFP labeling of somatic cells, and 55% now displayed germline labeling as well, including GSCs (Figure 6E–F’). These results indicate that germline cells acquire JNK activity specifically during the refeeding phase, when the burst of dedifferentiation takes place (Figure 2A). JNK pathway activity is required for bam-lineage spermatogonial dedifferentiation. (A–E) Representative images of testes where puckeredE69 (puc)-Gal4 was lineage-traced at 0 days fed (A), 15 days fed (B), 20 days fed (C), after 15 days starved (D) and after 15 days starved and 5 days refed (E). Under fed conditions, puc-lineage cells were restricted to some niche cells (asterisk) (A–C). After 15 days of starvation, most testes had puc-lineage labeling of somatic cells (quantified in F) (D). Only during the refeeding phase were puc-lineage germline cells observed (quantified in F) (E). Arrows in E mark puc-lineage-positive GSCs and the bracket in E marks puc-lineage-positive spermatogonia. (F, F’) Graphs indicating the percentage of testes that had pucE69-Gal4- (F) or puc-IT.Gal4- (F’) lineage positive somatic cells (light gray bars) or germline cells including GSCs (dark gray bars) at the time points indicated in A-E, as well as at 2 and 3 days of refeeding in (F). 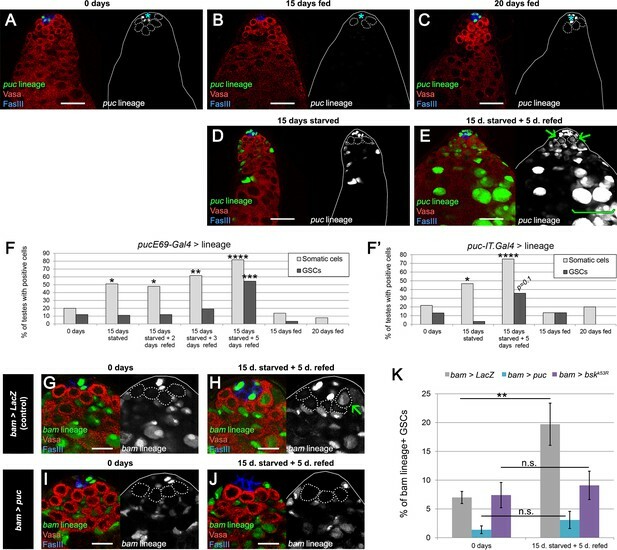 (G–J) Representative images of the testis stem cell niche in control bam-Gal4, UAS-LacZ (bam > LacZ, G, H) or bam-Gal4, UAS-puc (bam > puc, I, J), where we blocked JNK signaling, at 0 days (G,I) of after 15 days of starvation and 5 days of refeeding (H,J). The bam lineage is labeled in green, the germline (Vasa) is red and the niche (FasIII) is blue. GSCs are outlined by the dashed line. There are no GSCs derived from the bam-lineage cells in the control or bam > puc testes at 0 days (G, I). After starvation and refeeding, the control (bam > LacZ) contains GSCs positive for the bam-lineage (indicating that they arose through dedifferentiation) (H, arrow). However, under the same conditions, there are no bam-lineage positive GSCs in the bam > puc testis (J), indicating that JNK signaling is required for dedifferentiation. (K) Quantification of the rate of bam-lineage dedifferentiation among GSCs in controls (gray bars) and after repressing the JNK pathway with either UAS-puc (blue bars) or a dominant negative form of basket (UAS-bskK53R) (purple bars). Both transgenes are able to block dedifferentiation, mimicking the effects of bam mis-expression. Scale bars in A-E represent 20 µm, while in G-J they represent 10 µm. Bars in the graphs represent mean ±SE. *p<0.05, **p<0.01, ***p<0.001, ****p<0.0001. We analyzed germline labeling at 2 and 3 days post refeeding to gain insight into how spermatogonial cysts dedifferentiate (Figure 6F). Because prior work has documented fragmenting of 4- and 8-cell gonia prior to dedifferentiation into GSCs (Brawley and Matunis, 2004; Sheng et al., 2009; Cheng et al., 2008; Sheng and Matunis, 2011), we predicted that we would observe a majority of testes with only gonia but not GSCs labeled with puc > GFP at these time points. Of the 97 testes scored at 2 and 3 days post refeeding, 17 (17.5%) had germline labeling (defined as any GSC, 1-, 2-, 4-, 8- and/or 16-cell gonia expressing puc > GFP). Of these 17 testes, most (n = 15) had at least 1 GSC labeled as well as various gonia; only two testes had gonia but no GSCs labeled. We speculate that high number of cases where an entire germline lineage is labeled results from the considerable time (>24 hr) required to activate puc, recombine the lineage-tracing cassette and induce GFP expression. Our observations are consistent with JNK-activated gonia breaking apart and liberating gonial cells to dedifferentiate into GSCs. However, we cannot rule out the possibility that during refeeding JNK signaling is directly activated in resident GSCs that have not dedifferentiated. In support of our model that spermatogonia fragment and revert to the GSC state after autonomous JNK activation, we observed one testis at 3 days of refeeding where a 4-cell gonia labeled with puc > GFP appeared to fragment into a 3-cell gonia and a GSC at the niche (Figure 6—figure supplement 1). Each germ cell in the 3-cell gonia had a dot spectrosome, characteristic of fragmenting germ cells during dedifferentiation and very early germ cells (GSCs and gonialblasts) in wild type (Cheng et al., 2008; de Cuevas et al., 1997). To functionally test the relevance of JNK activity in spermatogonial dedifferentiation, we blocked its activity in the bam-Gal4 lineage by mis-expressing the JNK inhibitor puc or a dominant negative form of the JNK basket (bsk). Concomitantly, we lineage traced bam-Gal4 cells. If JNK activity is necessary for dedifferentiation, we predict that blocking its activity would reduce dedifferentiation upon refeeding. Indeed, after one cycle of starvation and refeeding, the increase in bam-lineage GSCs was no longer detectable in bam > puc or bam > bskDN testes compared with bam > LacZ controls (Figure 6G–K). We note that neither mis-expression of puc nor bskDN appears to adversely affect germ cell differentiation as robust spermatogonia and spermatocytes expressing puc or bskDN survive and continue to progress towards meiotic stages (Figure 6—figure supplement 2). Taken together, these results indicate that JNK pathway activity is autonomously necessary for germline cells to undergo dedifferentiation. While spermatogonial dedifferentiation increases during aging (this study and (Cheng et al., 2008)), the biological role of this process has remained unknown. Surprisingly, through a combination of genetic methodologies, we demonstrate that dedifferentiation of the bam lineage plays no role in maintaining the GSC pool during aging under standard conditions (abundant food and no females). Instead, we find that under normal but stressful conditions such as mating or under challenging conditions such as starvation and refeeding, dedifferentiation is important for both the quick recovery of the GSC pool in the short term and the preservation of the stem cell number in the long term. These results lead us to propose that bam-lineage dedifferentiation is akin to a regenerative response aimed to preserve the number of gonadal stem cells under adverse situations but is dispensable under optimal life conditions. This model is consistent with previous results demonstrating an increase in dedifferentiation after damage induced by irradiation (Tetteh et al., 2016; van Es et al., 2012; Cheng et al., 2008). Furthermore, our results suggest that spermatogonial cysts can fragment and the liberated germ cells migrate back to the niche to become functional GSCs, similar what was observed upon regeneration of the germline after GSC depletion (Figure 7 and [Brawley and Matunis, 2004; Sheng et al., 2009]). Since germ cells from fragmented cysts have to compete against resident GSCs as well as resident somatic stem cells in order to re-occupy the niche, germ cells that successfully dedifferentiate must have increased competitive properties, which are currently not understood. Future work using live imaging will be needed to uncover the dynamics of this process. Model of spermatogonial dedifferentiation under chronic challenging conditions. Top left, under normal conditions, GSCs divide and their offspring undergo normal differentiation into spermatogonia. Top right, under challenging conditions like starvation, there is a significant reduction in the number of GSCs and their offspring. Bottom, during the recovery phase, JNK signaling is triggered in spermatogonia (number 1), these cysts break apart and the germ cells dedifferentiate into GSCs (number 2). Dedifferentiated GSCs have higher proliferation rates than their wild type sibling GSCs and produce more offspring (number 3). Our results reveal a critical role of the JNK pathway in spermatogonial dedifferentiation. We have detected its activation during the refeeding phase after starvation and have proven its requirement in promoting this phenomenon (Figure 7). As mentioned above, we show that dedifferentiation is critical to maintaining a robust GSC pool during challenging conditions and as such is similar to a regenerative response. Recently, several studies have demonstrated the importance of the JNK pathway for proliferation, for triggering other signaling pathways, and for cellular reprogramming during regenerative events in imaginal discs (Bergantiños et al., 2010; Herrera et al., 2013; Smith-Bolton et al., 2009; Sun and Irvine, 2014; Herrera and Morata, 2014; Lee et al., 2005). It is unclear what JNK signaling regulates during spermatogonial dedifferentiation, but this phenomenon involves some of the features of regeneration, particularly reprogramming which reverts the cell identity to ‘stemness’. Taken together with our results, these studies suggest that JNK activity may be a universal feature of regenerative responses in Drosophila whether it is to reconstruct an appendage or recover a pool of stem cells. Similar to our results, two previous studies did not detect bam-lineage-traced, dedifferentiated GSC in the testis during protein starvation (Yang and Yamashita, 2015; McLeod et al., 2010). Therefore, there is consensus in the field that germline dedifferentiation does not occur during starvation. Our work shows that dedifferentiation occurs during the refeeding period with the maximal percentage of dedifferentiated GSCs being observed only after 5 days. We note that another group did not observe dedifferentiation during the refeeding period. However, they only scored this event at 2 days after refeeding and not at later time points (McLeod et al., 2010). We think the discrepancy between our studies is due to the different lengths of the refeeding period. One caveat of our results is the possibility that spurious activity of bam-Gal4 in GSCs could be forcing the recombination of the GFP flip-out cassette and thus marking them indistinguishably from truly dedifferentiated cells. There are, however, three arguments against this being responsible for the increase in bam-lineage labeled GSCs: (1) we failed to detect real time expression of bam-Gal4 in GSCs (Figure 1—figure supplement 2); (2) preventing dedifferentiation (bam > bam) blocked the increase in labeled GSCs in every scenario we tested; and (3) under challenging conditions, the GFP-positive GSCs were demonstratively more proliferative than their unlabeled siblings, a result that is inconsistent with spurious labeling. Another caveat of our experiments is that the extent of dedifferentiation may be underscored because our labeling methodology precludes us from lineage-tracing very early germ cells; the driver we used (bam-Gal4) is restricted to 4- and 8-cell spermatogonia and does not label gonialblasts (i.e., 1-cell) and 2-cell spermatogonia. To the best of our knowledge, there are no Gal4 lines specific to the lattermost cell types and at the same time excluded from GSCs. This limitation makes it impossible for us to track dedifferentiation of gonialblasts and 2-cell spermatogonia and likely causes undersampling of all dedifferentiation events. We note that examples of dedifferentiation from 2-cell gonia have been documented by live imaging (Sheng and Matunis, 2011); this study also showed that ‘symmetric renewal’ occurs when the gonialblast of a GSC-gonialblast pair swivels into the niche resulting in two stem cell offspring instead of 1 stem cell and 1 differentiating offspring. ‘Reversion’ occurs when spermatogonial cysts break apart and germ cells return to the niche to become functional GSCs (Sheng and Matunis, 2011). Both symmetric renewal and reversion could be at play in challenging conditions and may underscore why, following one cycle of starvation, the GSC pool does indeed recover albeit in a delayed fashion even when dedifferentiation is blocked (Figure 2B’). The inability to track dedifferentiation of gonialblasts and 2-cell gonia, combined with the less than 100% efficiency of Flp/FRT, may underlie the increased mis-oriented centrosomes in bam-lineage negative GSCs under a variety of conditions tested here. Although we observed a significantly higher proportion of bam-lineage GSCs with mis-oriented centrosomes compared to lineage-negative GSCs at day 0, there was no statistically significant difference between these two populations after 45 days of ‘normal’ aging (Figure 2—figure supplement 1), consistent with a prior report (Cheng et al., 2008). Additionally, we assessed mis-oriented centrosomes after challenging conditions like 1 cycle of starvation and refeeding and 4 cycles of challenging conditions and found no difference in bam-lineage positive vs negative GSCs (Figure 2—figure supplement 1). It is possible that the lineage-negative GSCs are in fact dedifferentiated from gonialblasts and 2 cell gonia. While we cannot experimentally test this hypothesis, if both types of GSCs were in fact derived from dedifferentiated gonia, this could account for the roughly equal rates of mis-oriented centrosomes in both pools (Figure 2—figure supplement 1). Despite similarly high rates of centrosome mis-orientation in bam-lineage dedifferentiated GSCs and lineage-negative siblings, the former proliferate faster. This result was unexpected, as it has been reported that dedifferentiated GSCs have decreased proliferation rates due to increased centrosome mis-orientation (Cheng et al., 2008). We speculate that downstream effectors of JNK signaling could be responsible for this increased cycling. The transient activity of JNK in germline cells that dedifferentiate could elicit a change in the epigenetic landscape by modulating Polycomb-group (Pc-g) and trithorax-group (trx-g) genes, as has been shown in several regenerative contexts (Herrera and Morata, 2014; Lee et al., 2005; Roumengous et al., 2017). Such epigenetic changes, possibly downstream of JNK/Pc-g or JNK/trx-g, may endow dedifferentiated GSCs with increased proliferation compared to their wild type siblings. For example, potential cell reprogramming of dedifferentiated GSCs may ‘refresh’ a stem cell’s genetic landscape, compared with its wild type siblings that may have acquired genetic damage or imprinting. Future experiments will be necessary to directly test these hypotheses. The following fly stocks were obtained from the Bloomington Drosophila Stock Center (BDSC): Oregon-R (Ore)R, Ubi-p63E(FRT.STOP)Stinger, UAS-RedStinger, UAS-LacZ, UAS-bskK53R, pucE69-Gal4, puc-IT.Gal4. Additionally, we used the following fly stocks: UAS-puc (Martín-Blanco et al., 1998); bam-Gal4:VP16 (Chen and McKearin, 2003); UAS-bam:GFP (Chen and McKearin, 2003); FRT40A and y, w, hs-Flp112; tub-Gal80, FRT40A (Amoyel et al., 2016). The primary antibodies used were: goat anti‐Vasa (Santa Cruz, 1:200), mouse anti-FasIII (Developmental Studies Hybridoma Bank (DSHB), 1:50), mouse anti-α-Spectrin (DSHB, 1:50), mouse anti-γTubulin (Sigma, 1:100), rabbit anti-phospho-Histone3-Ser10 (Millipore, 1:200). 5‐ethynyl‐2′‐deoxyuridine (EdU, Invitrogen) labeling was carried out as previously described (Amoyel et al., 2014). In all the experiments, flies were raised at 25°C. For standard aging conditions, virgin males were collected and kept isolated from females. Flies were kept in vials with food at a density of 20 males per vial (1-inch width) and transferred into fresh new vials every 2 days. Flies were maintained on standard fly food. For starvation (protein deprivation) periods, males were transferred into vials with 10% sucrose/1% agar, replaced by fresh ones every 2 days. For aging in the presence of females (mated males), a maximum of 20 males were placed in the same vial with 40 young (no older than 1 week) wild type (Oregon-R) virgin females. Flies were transferred to new vials every 2 days, and the females were replaced by new young virgins every 2 weeks. For aging in challenging conditions, we subjected flies to a regime of cycles of the following composition: 6 days of protein deprivation, followed by 2 days of refeeding in standard food and two additional days of refeeding in standard food in the presence of virgin wild type Oregon-R females in a 2:1 ratio of females to males. At the end of each cycle, females were discarded. For the last cycle, we extended the refeeding time one extra day, so the refeeding phase encompassed 5 days instead of 4, in order to collect testes with a degree of recovery comparable to the single-cycle experiments. We scored a cell as a GSC if it met these conditions: (1) it is Vasa-positive (Vasa is expressed only in germline cells in the testis); (2) it is a single cell that is not part of a spermatogonial cyst; (3) it makes direct contact with the niche (FasIII-positive cells). In some experiments, the second criterion was evaluated by assessing the presence of dot fusomes when stained with α-Spectrin, as this is a hallmark of GSCs. In the course of our experiments, we realized that distinct genotypes have a different number of GSCs at 0 days (see Figure 4I for example). To compare total GSCs in each genotype over time, we normalized the total number of GSCs at each time point to that of the start (i.e., day 0). For this reason, most of the data are shown as ‘relative GSC number’, thus enabling direct comparisons between genotypes after the same treatment. The percentage of dedifferentiation is calculated as (1) the proportion of GFP-positive (i.e., bam-lineage-positive) GSCs divided by the total number of GSCs in each individual testis and (2) each testis in a particular genotype was averaged. The number of cysts at each stage in Figures 4I, J and 5A was scored using the α-Spectrin antibody, which labels the fusome that connects all the cells in a spermatogonium. The percentage of GSCs with mis-oriented centrosomes was calculated by means of an established methodology (Cheng et al., 2008). Images were acquired on a Zeiss LSM 510 confocal microscope. Image analysis and quantifications were performed with Fiji-ImageJ (Schindelin et al., 2012) and Adobe Photoshop software. Fisher’s exact tests were used for Figures 5B, C and 6F–F’ and Figure 3—figure supplement 1A,B,E. The rest of the statistical tests were performed with Student’s t tests. Data were analyzed with Microsoft Excel and GraphPad Prism. A summary of results, including averages and sample sizes is included in Supplementary file 1–3. Paint3D was used in Figure 6—figure supplement 1 to illustrate the position of the confocal slice in the z-stack as well as to indicate the position of the fragmenting germ cyst. Annual Review of Genetics 31:405–428. Annual Review of Cell and Developmental Biology 31:291–315. Disease Models & Mechanisms 9:487–499. Nature Reviews Molecular Cell Biology 17:413–425. Cold Spring Harbor Perspectives in Biology 3:a002642. Current topics in developmental biology 108:95–120. Thank you for submitting your article "JNK triggers dedifferentiation during chronic stress to maintain the germline stem cell pool in the Drosophila testis" for consideration by eLife. Your article has been reviewed by three peer reviewers, including Yukiko M Yamashita as the Reviewing Editor and Reviewer #1, and the evaluation has been overseen by Marianne Bronner as the Senior Editor. The following individual involved in review of your submission has agreed to reveal their identity: Michael Buszczak (Reviewer #3). As is provided below in reviewers' individual comments, all felt that this study provides significant insights into biological significance of dedifferentiation, warranting publication in eLife. However, there are several issues that need to be addressed prior to acceptance. Since reviewers' individual comments are not conflicting and in agreement, we decided to provide full review comments as is such that the authors can see the full spectrum of the basis of our discussion. - There are several concerns regarding Bam-gal4-mediated lineage tracing of dedifferentiated GSCs. Although Bam-gal4-mediated lineage tracing indeed marks dedifferentiation, it does not mark all of dedifferentiated cells, because 2-cell SGs do not express bam-gal4. However, 2-cell SGs are considered to dedifferentiate more than 4- and 8-cell SGs due to their proximity to the niche. Thus, one would have to assume that there are many more dedifferentiated GSCs that are negative for lineage-marker than those positive for lineage-marker. Throughout the Results section, the authors do not sufficiently acknowledge this (highly likely) possibility, and draw strong conclusions, essentially assuming that all of linage-negative cells have never undergone dedifferentiation. This includes their conclusions of 1) centrosome misorientation does not correlate with dedifferentiation. 2) dedifferentiated GSCs proliferate faster. These overstatements/ over-interpretations have to be corrected. 2) Dedifferentiation and re-differentiation are likely a dynamic process, and simple lineage tracing may not be sufficient to draw some conclusions described in this manuscript. Especially, the reviewer felt that it is not yet convincing to rely on lineage tracing (and counting clone number) to measure the activity of GSCs. It is equally conceivable that dedifferentiation causes fragmentation of the cysts, creating multiple 'clones' by fragmentation (thus, higher number of marked clones may not reflect higher proliferation rate). The authors would need additional evidence to make a point that dedifferentiated GSCs are more proliferative – ideally live imaging, or additional cell cycle markers such as mitotic index. If such experiments cannot be conducted to obtain conclusive results, the authors should not make such a statement. 3) In regards to the puc>GFP lineage tracing, the authors should present a time course to show whether labeled cells always originate from 4-cell and 8-cell cysts, as opposed to GSCs, GBs, and 2-cell cysts. In this manuscript, Herrera and Bach reports an exciting study that examines the biological significance of dedifferentiation in Drosophila testis. They used an elegant genetic technique to block dedifferentiation (however, note that this blockade of differentiation is not expected to be complete, see below) and found that dedifferentiation is required to maintain the GSC pool under 'challenging' conditions such as protein starvation. They further show that JNK pathway regulates dedifferentiation. The experiments are conducted to a high standard, supporting an exciting conclusion. I have several comments to be addressed prior to publication (they must be addressed, thus fall into 'major' comments, but they are quite straightforward to address). - bam-gal4 mediated experiments can only manipulate 4-cell spermatogonia and later, excluding the contribution of dedifferentiation from gonialblasts and 2-cell spermatogonia from testing (and those earlier SGs are considered to be more prone to dedifferentiation). Therefore, I suggest the authors to be cautious in stating 'dedifferentiation is not required under unchallenged conditions'. Their results demonstrate that the dedifferentiation from 4/8 SGs do not contribute to GSC maintenance during aging under 'normal' conditions. This clarification does not decrease the impact of this work, but I think it is important to mention throughout the text. - Subsection “Dedifferentiation accelerates the recovery of the GSC pool after starvation”, last paragraph: the authors state that both native and dedifferentiated GSCs have equally high frequency of centrosome misorientation. Again this comes back to the point of 'GSCs dedifferentiated from gonialblast or 2-cell SGs'. Indeed, our prior work (Cheng et al., 2008) observed that centrosome misorientation increase during aging even in 'unmarked' GSCs (not marked by bam-gal4 lineage tracing) and we speculated in this paper that this may reflect dedifferentiation from GB or 2 cell SGs (the centrosome misorientation is speculated to result from not having the original mother centrosome, which would be true with dedifferentiation from GB or 2 cell SGs). I think it is important to acknowledge the likely contribution of GB and 2-SG in dedifferentiation (especially because they are considered to be more prone to dedifferentiation compared to 4 or 8 SGs). - In Figure 3 they show that presence of female impact dedifferentiation, and reveals the need of dedifferentiation (bam>bam flies decrease GSC pool). This is exciting (and I rather consider this as 'physiological condition' as flies in wild are supposed to be mating, than not mating at all in specific laboratory condition). I wonder if constantly supplying virgin females might further reveal the importance of dedifferentiation. They add virgin females in 'challenging' conditions (repeated cycle of starvation and mating etc. in Figure 4), but 'encountering virgin females periodically' should not be considered a challenge (it's physiological), and examining the impact of such a condition might reveal 'physiological role' of dedifferentiation. - Figure 5: EdU incorporation cannot be used as a measure of cell cycle on its own, unless combined with mitotic index, because high EdU can simply mean that many cells are spending more time in S phase (instead of cycling faster). - Discussion starts by stating 'dedifferentiation plays no role under standard aging conditions', which is an overstatement in my opinion because their experimental scheme cannot test the contribution of dedifferentiation from GB and 2 cell SG. They only discuss this possibility in the middle of Discussion, whereas they have never discussed this important possibility until this point. The authors should acknowledge this much earlier and fully integrate this possibility in the interpretation of their results starting in the Results section. -Figure 4 title: typo, “comprised” should be compromised. This paper describes an investigation into the role of dedifferentiation in maintaining the GSC pool in Drosophila testes during chronically stressful conditions. Using a clever technique for genetically manipulating partially differentiated germ cells, the authors find that dedifferentiation of germ cells that have reached the bam(+) stage are important for replenishing the GSC pool following chronic starvation or continuous mating. They also show that dedifferentiated GSCs have increased rates of proliferation relative to GSCs that have not been derived from a bam(+) germ cell, and that JNK signaling is upregulated during chronic stress and required for efficient dedifferentiation. In general, I think their observations are novel and will be of broad interest. I also think that the data provide strong support for the central claims of the paper. In this manuscript, Herrera and Bach examine how the dedifferentiation of developing germ cells helps to maintain the germline stem cell pool in the Drosophila testis. The authors use a FLP-out lineage tracing system and over-express bam to block normal differentiation. They find dedifferentiation contributes little to the GSC pool in well-fed virgin males. By contrast, dedifferentiation does impact GSC numbers under "challenging" conditions, including mating and starvation. The authors provide evidence that GSCs arising from dedifferentiated cells are more active than their wild-type GSC siblings and that the JNK pathway is necessary for germ cell dedifferentiation in specific contexts. The authors make several strong conclusions which are not necessarily supported by the data. In the Abstract, the authors write "Strikingly, blocking dedifferentiation under normal laboratory conditions has no impact on the GSC pool." Again, in the Results they state "Although unexpected and contrary to our predictions, these results preclude an important role for dedifferentiation of the bam-Gal4 lineage in maintaining the GSC pool during aging under normal laboratory conditions." I think the authors should be much more explicit in the description of the conditions they are testing in both cases. They should clearly state that this observation is made in testes from unmated/virgin males, since I would consider mating a "normal" activity of male Drosophila. In regards to this experiment, the authors should also investigate or cite the relevant literature that describes how GSCs behave in unmated males. Are they as proliferative as those from mated males? Are they lost at the same rate (which should be assayed through clonal analysis)? If GSCs in unmated males are simply less active and are maintained for longer periods of time, the observed result is exactly what one would expect. Although the authors do mention the possibility in their discussion, making this statement in the Abstract ignores the possibility that two and four cell cysts (pre-bam expressing cells) dedifferentiate in unmated males. Examining centrosome orientation (which they use in later experiments) and live cell imaging could help clarify whether no dedifferentiation is occurring in these samples. The authors draw the conclusion that dedifferentiation accelerates the recovery of the GSC pool after starvation. This conclusion is based on the observation that testes which have at least 1 bam-GAL4 marked GSC "fully recovered" the pool of GSCs in 3 days, as opposed to those that have 0 dedifferentiated GSCs, which recovered the GSC pool in 7 days. This is a correlation, and the authors should characterize this phenotype in greater depth before making any firm conclusions. For example, the rate and levels of dedifferentiation may be exactly the same in both samples, but different testes may exhibit differences in cell death or GSC loss, in addition to any number of other variables, such as GSC proliferation and symmetric renewal. Again, live cell imaging may provide a more complete picture of how these cells are behaving in different circumstances. The authors observe that dedifferentiated GSCs and their wild-type siblings display the same level of centrosome mis-orientation. This appears to be directly at odds with Cheng et al. Do the authors make this observation in all cases of dedifferentiation, or only in those testes from males subjected to starvation and refeeding? Further discussion of differences between this study and previous work is warranted. The authors observe that dedifferentiated GSCs are more proliferative than their wild-type siblings based on the numbers of GFP positive cells within the testes. However, one cannot be certain that a particular labeled cell/cyst originated from a dedifferentiated GSC as opposed to a cyst that is in the process of breaking down. Dedifferentiation and redifferentiation may be a constant dynamic process. Do the authors have evidence that dedifferentiating cysts have to take on GSC identity before producing differentiating progeny? Again, the observation that dedifferentiated GSCs proliferate at a higher rate than wild-type cells contradicts previous studies. I would like to see live cell imaging that shows higher rates of cell division in the dedifferentiated GSCs and/or additional cell cycle/mitotic markers. In regards to the puc>GFP lineage tracing, the authors should present a time course to show whether labeled cells always originate from 4-cell and 8-cell cysts, as opposed to GSCs, GBs, and 2-cell cysts? Thank you for resubmitting your work entitled "JNK triggers dedifferentiation during chronic stress to maintain the germline stem cell pool in the Drosophila testis" for further consideration at eLife. Your revised article has been favorably evaluated by Marianne Bronner (Senior Editor), a Reviewing Editor, and two reviewers. The reviewers appreciate that the authors addressed most of concerns raised during the first round of the review. Reviewer #3 raised a few points that other reviewers agreed to be important points. These points can be simply addressed by textual changes, and we would like the authors to edit the text to reflect on those points. After that, the reviewing editor should be able to editorially accept the manuscript. The authors have addressed my concerns and I think the paper is now ready for publication. The authors have addressed many of my previous concerns. I have just a couple of points that need further clarification. The authors state: "Prior work has shown that the number of GSCs decreases slightly during aging under normal laboratory conditions, and this has led to the model that dedifferentiation provides a means to offset normal GSC loss during lifespan (Wang and Jones, 2011; Wallenfang, Nayak and DiNardo, 2006; Cheng et al., 2008). If this hypothesis is correct, we would expect a further reduction in GSC number after bam mis-expression by bam-Gal4.". They then present data that shows GSC numbers do not drop further when dedifferentiation is blocked, opposite from their expectations. Previous results from the Matunis lab have shown that GSCs can undergo symmetric renewal. Perhaps blocking dedifferentiation forces the testis to use this alternative mechanism for maintaining GSC numbers. This does not necessarily mean that dedifferentiation does not play a role in maintaining GSC numbers in older flies. By blocking dedifferentiation, one may be shifting the equilibrium towards this and other potential mechanisms to maintain GSC numbers. The authors go on to write "Although unexpected and contrary to our predictions, these results strongly suggest an important role for dedifferentiation of the bam-Gal4 lineage in maintaining the GSC pool during aging under normal laboratory conditions." This conclusion seems at odds with the data that precedes it. Indeed, in the abstract the authors state "blocking bam-lineage dedifferentiation under normal conditions in virgin males has no impact on the GSC pool." Perhaps the authors could rephrase their concluding sentence in the Results section and mention the aforementioned alternative mechanisms. The paper is entitled "JNK triggers dedifferentiation during chronic stress to maintain the germline stem cell pool in the Drosophila testis" The authors state in the final paragraph of the Results section- "To functionally test the relevance of JNK activity in spermatogonial dedifferentiation, we blocked its activity in the bam-Gal4 lineage by mis-expressing the JNK inhibitor puc or a dominant negative form of the JNK basket (bsk). Concomitantly, we lineage traced bam-Gal4 cells. If JNK activity is necessary for dedifferentiation, we predict that blocking its activity would reduce dedifferentiation upon refeeding. Indeed, after one cycle of starvation and refeeding, the increase in bam-lineage GSCs was no longer detectable in bam>puc or bam>bskDN testes compared with bam>LacZ controls (Figure 6G-K). Taken together, these results indicate that JNK pathway activity is autonomously necessary for germline cells to undergo dedifferentiation." Can the authors clarify whether cells expressing puc or basketDN survive and continue to differentiate? I do see bam-lineage positive cyst in Figure 6J, which partially speaks to this point. The worry is that over-expression of puc or bskDN reduces germ cell viability, which could interfere with the interpretation of the data. We thank the reviewers for pointing this out. In the revised manuscript, we added several sentences/paragraphs to the Results and the Discussion that we are underlabeling dedifferentiated cells because it is believed that gonialblasts and 2-cell spermatogonia dedifferentiate but they are not labeled by bam-Gal4. We do not know the degree to which these events occur, but we now acknowledge that we are not monitoring all dedifferentiated cells. Furthermore, from Results onwards and in figures and legends, we specifically mention that we will refer to dedifferentiated cells as bam-lineage derived GSCs and the unlabeled GSCs as bam-lineage negative cells. We now discuss all conclusions in the context of bam-lineage cells. We have also performed additional experiments to address the proportion of mis-oriented centrosomes in various conditions. At day 0, we find that bam-lineage GSCs have significantly more mis-oriented centrosomes than lineage-negative GSCs (see first set of bars in our Figure 2—figure supplement 1). This is in accordance with Cheng et al., 2008 (see their Figure 5E, second set of bars). At 45 days in fed, unmated, normal laboratory conditions, we find similar rates of mis-oriented centrosomes (~40-45%) in both bam-lineage positive and lineage-negative GSCs. This is quite similar to the 50 day time point reported by Cheng et al. (see their Figure 5E, last set of bars) where there was no significant difference between LacZ (i.e., bam-lineage)-positive and LacZ-negative GSCs. Additionally, we monitored centrosome mis-orientation after 4 cycles of chronic challenging conditions and found no significant difference in rates between bam-lineage positive and negative GSCs (see our Figure 2—figure supplement 1, last set of bars). These new data have been added to the revised manuscript (in Figure 2—figure supplement 1) and to the sixth paragraph of the Discussion. [In the original manuscript, we found no difference in centrosome mis-orientation in bam-lineage positive vs. negative GSCs after 1 cycle of starvation and refeeding, and these results are retained in the revised manuscript in Figure 2—figure supplement 1, third set of bars.] We have made two points regarding these results in the revised manuscript. First, we acknowledge that the lineage-negative GSCs likely include cells derived from gonialblasts and 2-cell gonia that are not label by bam-Gal4. We write: “It is possible that the lineage-negative GSCs are in fact dedifferentiated from gonialblasts and 2-cell gonia. While we cannot experimentally test this hypothesis, if both types of GSCs were in fact derived from dedifferentiated gonia, they would account the roughly equal rates of mis-oriented centrosomes in both pools.” Second, as there is no difference in centrosome mis-orientation between bam-lineage positive and negative GSCs in challenging conditions, we conclude that there is likely another explanation for the increased rate of proliferation of lineage-positive GSCs after 4 cycles. We write: “These data suggest that in some challenging conditions, factors independent of centrosome orientation may regulate GSC proliferation rates”. As addressed in the next point, we found a higher rate of S- and M-phase in bam-lineage positive GSCs compared to lineage-negative ones. Therefore, even with the considerations described in the previous paragraph, lineage-positive GSCs do have a higher proliferation rate. This suggests that factors in addition to centrosome orientation regulate GSC proliferation. In the revised manuscript we speculate that lineage-positive GSCs have experienced autonomous JNK activity and this may “epigenetically reprogram” these cells, which may impact proliferation rates. In the revised manuscript, we carefully and precisely frame our results in the context of lineage (bam vs not bam) and still observe a significant increase in the rate of proliferation of lineage-positive GSCs. We agree with the reviewers’ concern about the need for additional evidence to support our conclusion that bam-lineage GSCs have a higher proliferation rate. To address this point, we subjected males to 4 cycles of challenging conditions and stained testes with anti-phospho Histone H3-Ser10 (pH3) (Millipore) that was recommended to us by experts in the field (Drs. Fuller, Yamashita and Jones). Using this antibody, we found that there were significantly more pH3-positive bam-lineage GSCs compared to lineage-negative GSCs (n=100 testes and >1,221 GSCs analyzed, p<0.053). These data have been added to the revised manuscript in Figure 5C and are discussed in the Results subsection “bam-lineage dedifferentiated GSCs are more proliferative than their siblings”. Taken together with the significant increase in S-phase in bam-lineage positive GSCs as well as the number of offspring (Figure 5A, B), we conclude that bam-lineage GSCs have a higher proliferation rate than lineage-negative GSCs. Given the ~2 month time frame for submitting a revision and the fact that we have not optimized technically-challenging, live imaging methodologies in our lab, we have not been able to perform live imaging experiments for this study. We thank the reviewers for pointing this out. To address this concern, we surveyed puc>GFP lineage labeling at two additional time points during refeeding (at 2 and 3 days). Based on prior work from the Matunis and Yamashita labs, we predicted that spermatogonia during the refeeding would experience transient JNK activity, fragment and migrate back to the niche. If this were the case, then we would expect to see only spermatogonia but not GSCs labeled at earliest time point. However, of the 97 testes examined, 17 (17.5%) had any germline labeling. Of these 17 testes, most (n=15) had at least 1 GSC labeled as well as various gonia. In fact, only 2 testes had gonia but no GSCs labeled. We speculate that the high number of cases where an entire germline lineage is labeled results from the considerable time (>24 hours) needed to induce puc, recombine the lineage-tracing cassette and then induce GFP. Nevertheless, our observations are consistent with JNK-activated gonia fragmenting and some of these gonial cells returning to the niche to revert to GSCs. We acknowledge that we cannot exclude the possibility that JNK signaling is directly activated in resident GSCs that have not dedifferentiated during the refeeding period. However, in support of our model that spermatogonia fragment and revert to the GSC state after autonomous JNK activation, we observed one testis at 3 days of refeeding where a 4-cell gonia labeled with puc>GFP appeared to fragment into a 3-cell gonia and a GSC at the niche (see new Figure 6—figure supplement 1). Within the 3-cell gonial cyst, each germ cell had a dot spectrosome, characteristic of fragmenting germ cells during dedifferentiation and very early germ cells in wild type testes. These data are discussed in the fourth paragraph of the subsection “The JNK pathway is necessary for bam-lineage spermatogonial dedifferentiation”. […] I have several comments to be addressed prior to publication (they must be addressed, thus fall into 'major' comments, but they are quite straightforward to address). We thank the reviewer for pointing this out. We acknowledge this and as discussed above in the response to reviewers, in the revised article we refer to dedifferentiated cells as bam-lineage derived and the other GSCs (which may be WT or dedifferentiated from gonialblasts or 2-cell spermatogonia) as lineage-negative. We agree that dedifferentiation of gonialblasts and 2-cell spermatogonia likely contribute to the pool of GSCs in testes from aged and challenged males. This is now acknowledged in numerous places in the text (see above). We agreed with this reviewer and with reviewer #3 that mating is a normal physiological response of males to the presence of females. However, mating is also an energy-intensive activity that can negatively impact males. For example, mated males have significantly shorter lifespans than unmated males (Branco, 2017). Hence, we conclude that mating, while normal, is stressful to males. In the text of the revised manuscript, we acknowledge both of these facts. Additionally, in response to reviewer #3 (see below), we have found that mating provokes an overall increase in GSC proliferation compared to aged-matched, unmated males (see Figure 3—figure supplement 1). This suggests that mating induces a systemic response that increases GSC division rates. Furthermore, again as described below, we find that neutral GSC clones are lost significantly from the testis niche upon mating, presumably due to increased proliferation rates of GSCs as well as outcompetition of resident GSCs by dedifferentiating germ cells. We agree with the reviewer. To address this point, we stained testes from control bam>LacZ males after 4 cycles of challenging conditions with the anti-pH3 described above. We found significantly more bam-lineage positive GSCs in M-phase compared to lineage-negative GSCs (p<0.053). These raw data are in the new Supplementary file 2 and also presented in Figure 5C in the revised manuscript. Taken together with our prior EdU incorporation results (which was significantly higher in bam-lineage GSCs), we conclude that bam-lineage GSCs cycle faster than lineage-negative GSCs. We thank the reviewer for point this out. As discussed in detail above, we have now incorporated this possibility into the first paragraph of the Results where we describe the lineage tracing. We now treat in greater detail this possibility in the Discussion. Thank you for pointing out this typo. We have fixed this in the revised manuscript. […] The authors make several strong conclusions which are not necessarily supported by the data. In the Abstract, the authors write "Strikingly, blocking dedifferentiation under normal laboratory conditions has no impact on the GSC pool." Again, in the Results they state "Although unexpected and contrary to our predictions, these results preclude an important role for dedifferentiation of the bam-Gal4 lineage in maintaining the GSC pool during aging under normal laboratory conditions." I think the authors should be much more explicit in the description of the conditions they are testing in both cases. They should clearly state that this observation is made in testes from unmated/virgin males, since I would consider mating a "normal" activity of male Drosophila. We thank the reviewer for pointing this out. As described above, we now clearly indicate that these initial experiments were performed on unmated males. We have also updated the Abstract to reflect the fact that bam-lineage dedifferentiation does not impact the GSC pool in unmated males but does play an important role in maintaining this pool of stem cells in mated males and/or stressful conditions (like starvation). In regards to this experiment, the authors should also investigate or cite the relevant literature that describes how GSCs behave in unmated males. Are they as proliferative as those from mated males? Are they lost at the same rate (which should be assayed through clonal analysis)? If GSCs in unmated males are simply less active and are maintained for longer periods of time, the observed result is exactly what one would expect. Although the authors do mention the possibility in their discussion, making this statement in the Abstract ignores the possibility that two and four cell cysts (pre-bam expressing cells) dedifferentiate in unmated males. Examining centrosome orientation (which they use in later experiments) and live cell imaging could help clarify whether no dedifferentiation is occurring in these samples. The reviewer has raised some important concerns. First, we were unable to find any literature on the effects of mating on GSC proliferation. As such, we performed experiments to directly address this. We show in Figure 3—figure supplement 1 of the revised manuscript that the rate of mitosis (pH3-positive GSCs) is significantly higher in testes from mated males compared to age-matched, unmated males. Moreover, we analyzed the mitotic rate of bam-lineage-positive GSCs vs. lineage-negative GSCs in both conditions. We found that both types of GSCs have significantly higher mitotic rates compared to those in unmated controls (6.44% vs. 9.56% in lineage-negative cells (p<0.068) and 6.15% vs 13.61% in lineage-positive cells (p<0.034)). These data suggest that there is a systemic response to mating that increases proliferation of all GSCs. We also performed the clonal analysis suggested by the reviewer. We made neutral FRT40A MARCM clones with which we have considerable experience (1, 2) in unmated vs. mated males at 2 and 15 days post clone induction (dpci). Both types of males had similar clone induction at 2 dpci, as expected. However, there were significantly fewer GSC clones at 15 dpci in the testes of mated males compared to unmated males. The GSC clone loss in mated flies is compatible with the increased rate of GSC proliferation discussed in the previous paragraph. Furthermore, it is also consistent with the presumed competition of dedifferentiating germ cells with resident GSCs for niche occupancy. These data are included in new Figure 3—figure supplement 1 and are discussed in the Results subsection "bam-lineage dedifferentiation preserves both the GSC pool and spermatogenesis during chronic challenging conditions”. We concur with the reviewer and have now moderated our conclusions about the correlation between the number of bam-lineage-positive GSCs and the recovery of the GSC pool. We now write: “Although we cannot exclude other variables such as germ cell death, GSC loss, and GSC gain through symmetric renewal, this correlation strongly suggests that bam-lineage dedifferentiation accelerates the recovery of the GSC pool under challenging conditions.” As noted above, given the time frame for revision and not having optimized live imaging methodology in our lab, which is technically challenging, we have not performed live imaging experiments for this study. In the original submission, we had examined centrosome orientation in GSCs after 15 days of starvation and 5 days of refeeding. Based on this reviewer’s concern, we examined centrosome orientation in several other conditions, specifically, 0 days, after 45 days in fed but unmated males, and after 4 cycles of starvation, refeeding and mating. We already provided a detailed response to this concern above in our answer to the first general point (see above). We agree with the reviewer and as described above we measured mitotic rate with pH3. This experiment revealed that there were significantly more bam-lineage-positive GSCs labeled with pH3 compared to lineage-negative GSCs (see above). Regarding dedifferentiation and redifferentiation, we have not been able to perform live imaging studies that may reveal such characteristics. However, in response to reviewer 3’s next comment (also addressed above in response to general question 3), we have now analyzed a time course of puc-lineage activation during the refeeding period. Please see above for a detailed response, but suffice it to say here, we find some evidence for fragmentation of 4-cell gonia and migration of one or more germ cells from this cyst back to the niche to re-acquire GSC status. This is an excellent suggestion. Please see above answer to general question 3. Reviewer 3 has raised an important point, that inhibition of JNK may be negatively impacting the health of germ cells. To address this concern, we have examined at least 15 testes of the bam>puc or bam>bskDN genotypes. In all cases, we found evidence for robust germ cell differentiation into pre-meiotic stages. Representative examples are included in a new supplementary figure (Figure 6—figure supplement 2). Additionally, we write “We note that neither mis-expression of puc nor bskDN appears to adversely affect germ cell differentiation as robust spermatogonia and spermatocytes expressing puc or bskDN survive and continue to progress towards meiotic stages (Figure 6—figure supplement 2).” We have also provided a legend for the new figure supplement. We thank Yukiko Yamashita, Ruth Lehmann, Gines Morata, the Developmental Studies Hybridoma Bank and the Bloomington Stock Center for stocks and antibodies, and Hyung Don Ryoo for critical reading of the manuscript. This work was supported by EMBO and HFSP LT000529-2015 fellowships (to SH), and NYSTEM N11G-292 and NIH R01 GM085075 (to EAB). © 2018, Herrera et al.